A fallout remover is a special product aimed at decontamination that has the chemical ability to help you to remove iron(III)oxide particles from a surface without having to remove them mechanically. These particles are loosened up via a chemical process, that allows for them to be rinsed off safely. There are a multitude of “fallout removers” available which have been specifically designed for this task. This includes products such as “Iron-X” from Carpro Trading ltd and “Ferrous Dueller” by Dodo Juice and several more. Fallout are iron particles that can come from different sources. This can be brake dust, iron particles from a railroad track or airborne particles from a factory nearby. There are several sources that these particles can come from. Iron particles have a microscopic outer edge that is very jagged. Unlike some sand grains that can be almost perfectly smooth, iron particles are very jagged and uneven. Iron also oxidizes, creating iron(III)oxide particles that have an even more jagged outside. These particles with there rough edges can get stuck to any surface really easily. The surface of paintwork for example is not completely flat when you look through a microscope, and these microscopic “hills and valleys” can be the place where these particles get stuck. When iron oxidizes, the surface expands a bit, which might cause them to get really stuck in there. The only real modern way to remove these particles is via claying or via a fallout remover. The last one is the safest option, although it is also more expensive. But it hasn’t always been like this. The industry-standard method for the removal of iron fallout in vehicle paint has involved removing the layer of affected paint through wetsanding and/or heavy polishing. Thanks to advancements in the field of detailing we now have a few product that offer safer and easier way to remove fallout. If you have a clean and polished surface, that is protected by a proper protective product and you clean that surface regularly (like a weekly wash), you will find that you can wash off 98% of the iron particles on the car. The most common place to find fallout is on your wheels, because of the brake dust from your brake discs. But it is possible to find fallout on pretty much any area on any vehicle. The term Fallout Remover is very popular, but it is also technically incorrect. this term is general, and encompasses numerous types of fallout of which iron is only one. The term ‘fallout’ itself simply means anything floating about in the atmosphere that falls out of suspension, and lands on the ground. There is also chemical fallout from industrial exhaust, oil/unburnt hydrocarbon fallout from vehicle exhaust, and organic fallout from living organisms (Trees and plants release pollen, insects crap, birds crap, etc.). Ferrous is another word for ‘iron containing’, and can be used to describe the particles you are trying to remove with this type of chemical. Chemical plants also do not typically release iron as an airborne waste product. Because of the jagged edges, iron(III)oxide particles are very sharp and cause several surface imperfections when they are dragged over a surface. Rubbing your paint with these particles still covering it, will cause severe swirls. Removing them will not only deep-clean your paintwork, but will also minimize the risk of swirls in the future even more. Fallout can also appear as dark dots on the paintwork and create an orange-looking haze over a light colored car. When these iron particles are left, they can cause corrosion pitting, eating deeper into your paint. When you apply a wax, polish or any other product that needs to be rubbed in, you need the surface to be perfectly clean. Not only because of the risk of swirls, but also because most products will not bond properly on a “dirty” surface. Removing fallout is simply part of proper decontamination. Citric acid helps precipitation of iron by ammonia by forming a complex with it. – Ammonia + Citric Acid + Thioglycolic Acid + Iron reacts to form ferric thioglycolate, which is red/purple in colour (Hence the ‘bleeding’ effect.). Thioglycolic acid helps to oxidize iron (II) to iron (III). – Accelerates oxidation process turning wustite (Mineral found in iron ore) into ferric oxide (rust) very quickly. This is a controlled corrosion process, or essentially, acid pickling. Ammonia to make solution alkaline – Adding an alkaline to the thioglycolic acid makes it very nearly pH-neutral in solution (In the bottle), until it contacts iron when an acidic reaction will start to take place, lowering the pH of the product in use. Fallout removers are not completely safe to use on all parts. The chemical process that causes the iron particles to be easily removed also accelerate corrosion on ferrous metal parts (brake components, suspension components, wheel bolts etc). The localized acidic reaction can even play a part in hydrogen embrittlement in certain components. A typical fallout remover is NOT a wheel cleaner! They are a chemical catalyst product that supports in the removal of a very stubborn form of contaminant. They are not designed to remove normal grime and dirt. 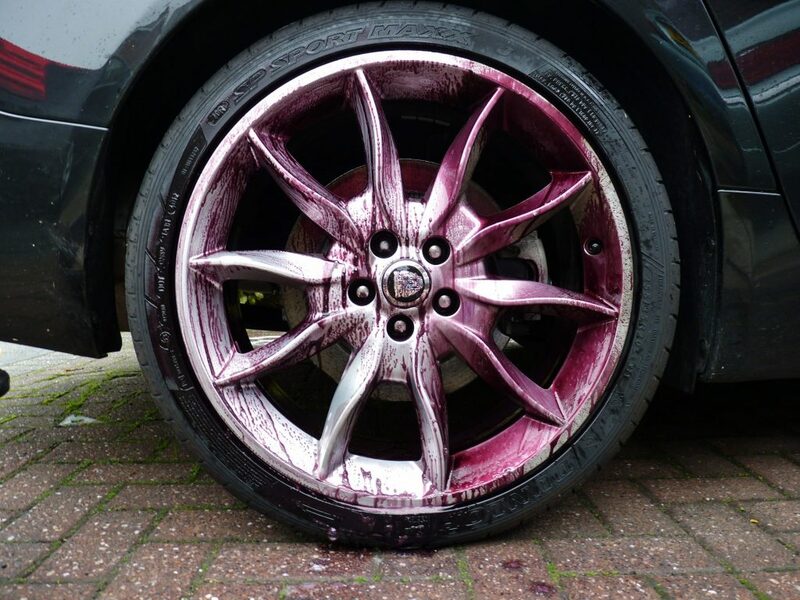 The amount of fallout your car will collect after a normal week of use is not severe enough to need a fallout remover (seeing as this amount can safely be washed off). Fallout removers are NOT made to be used weekly on the same surface, and CAN do severe damage. However, modern paintwork is much less affected by this and the risk is substantially smaller. But on older cars and old wheels, it is very much recommended to take great care!! Not every fallout remover turns red. AutoSmart has a product that doesn’t change color. It is possible to create a fallout remover that also aids in the removal of tar. Some fallout remover thicken a little bit after spraying, preventing it from running off the surface to quickly. The red color is the effect of an added ingredient that changes color after a certain chemical reaction, it does NOT indicate how well the product works. Only how much of that ingredient is added. Fallout removers are not the only way of removing fallout. It is possible to remove these particles by claying, however your clay will degrade faster, you need to rub the paint more (which will increase marring) and it is much more difficult to judge if all the particles are removed. As a historical fact, the ammonium-thioglycolate chemicals currently being used to remove iron fallout on vehicles were first developed to detect ferrous contaminants and inclusions in non-ferrous metals (Aluminium & stainless steel). They weren’t intended to actually remove the contaminants, but just tell the foundry that their batch of metal was bad; the colour change was the only desired effect. Fallout removers can have 2 components on which they are based: oxalic acid or thioglycolic acid. Both basic components have a different background. Oxalic acid was probably discovered around 1745 when Dutch botanist Herman Boerhaave isolated salt from sorrel. Francois Pierre Savary of Fribourg was in 1773 able to isolate oxalic acid from its salt in sorrel. In 1784 Carl Wilhelm Scheelde showed that his production of oxalic acid, called sugar acid (by reacting sugar with concentrated nitric acid) was identical to oxalic acid. It is generally used in bleaches, a mordant in dyeing processes, a third reagent in silica analysis intruments and as a part of baking powder. Oxalic acid is very effective for the removal of rust (iron complexing agent). Oxalic acid fallout removers generally don’t change color when coming in contact with iron deposits. Scientist David R. Goddard identified Thioglycolic acid around 1930 while studying why protease enzymes could not easily digest hair, nails, feather and such. Due to his research on this topic, thioglycolic acid was developed around 1940 for use as a chemical depilatory. Its precursor, ammonium thioglycalte is used for permanents by breaking the disulfide bonds in the cortex of hair. In a different form, this can be used for hair removal. Thioglycolic acid is part of the reason why a fallout remover turns red (the bleeding effect) when it comes into contact with iron deposits. The wheels that show the most red, is the wheel where the least of the iron particles where removed. Note that it is very important that both wheels are equally dirty, otherwise it won’t be a representative show of what product did the best cleaning, seeing as one wheel was simply dirtier than the other and needed more cleaning then the other.